More I look at replays, worse it gets. Ronda Rousey took 5 shots square in the face as hard as Nunes could throw 'em. Concussion city. 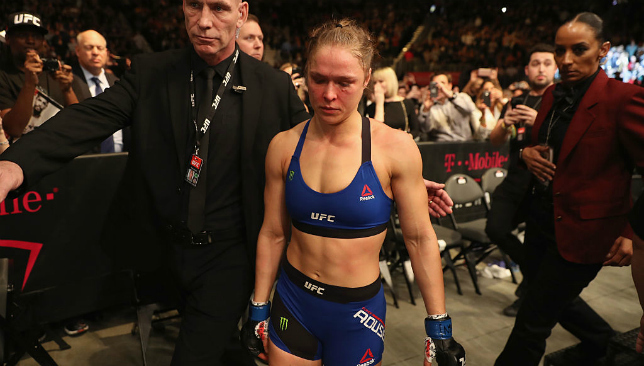 Ronda Rousey said she thought about suicide after her loss to Holly Holm. This is her life. Cant imagine how devastated she is mentally. Rousey bullied and strutted her way to the top of her sport. She created dangerous resentment. Nunes wanted to hurt her. And she did. Every time Ronda Rousey gets hit she looks like she's never been punched in the face before and doesn't know why it's happening. #UFC207 . Ronda Rousey has apparently left the arena. No surprise. She hasn't talked to the MMA media in over 13 months. Rousey widened the door for Women's UFC but cant take the heat when competitors surpass her. You don't get to be cocky AND a sore loser. Nunes criticizing Edmond Tarverdyan for putting the "crazy" idea in Rousey's head that she's a boxer. Thank you, Ronda Rousey, for propelling the sport of MMA to a place that it wouldn't have been without you!!! We all love you!!! The above video brings to you the official UFC weigh-ins before UFC 207 – which kicks off on Friday night in Nevada. Among those weighing-in were headliners Ronda Rousey and Amanda Nunes, who will go head-to-head for the Women’s Bantamweight Championship. Other MMA stars that hit the scale included Dominick Cruz and his opponent Cody Garbrandt, as well as T.J. Dillashaw and John Lineker. Are you looking forward to a big night of UFC action? WATCH: Rousey and Nunes' top 4 finishes ever! Bantamweight champion Dominick Cruz packs for his trip to Las Vegas, where challenger Cody Garbrandt visits a chiropractor. Fellow bantamweight TJ Dillashaw – a former teammate of Garbrandt and former opponent of Cruz — also arrives in town with that weight division’s belt on his mind. Which fighter are you most looking forward to seeing in action?